This is our family’s daily breakfast! It’s very filling, nutrient dense, loaded of vitamins and minerals. I will keep you satiated for quite some time! Chicken broth is not only nutritious, but a great tool to fight colds and GI ailments. It is soothing and healing to the gut, easily digestible and supports optimal immune function. The benefits of chicken broth are ancient and my chicken broth recipe is as low in histamine as it is possible. Instead of slow cooking we use a pressure cooker (check out this article on the benefits of cooking with a pressure cooker). This method of cooking is the best way we have found to keep our broth nutritious and low in histamine. 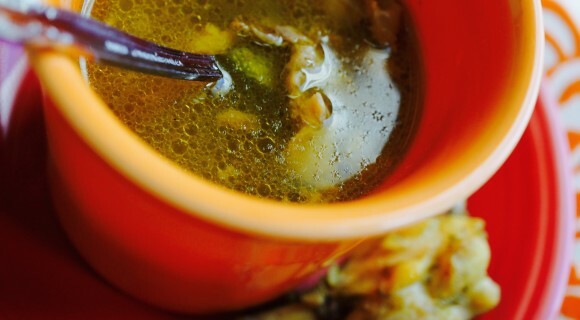 Check out my recipe for lower histamine All Day Chicken + Broth. We also add an egg yolk and a teaspoon of ghee to every cup. This turns the recipe into an amazing source of vitamin K, A, and D. If you want to boost it even more, add a teaspoon of yogurt, kefir or fermented veggies when the broth cools down. That will increase the histamine load but will also boost the numbers of probiotic flora in your belly! In a small sauce pan add chicken and chicken broth and bring it to a boil. In the mean time, add the egg yolk and ghee into a cup or bowl. Once chicken broth is warmed up, add the desired amount into your cup or bowl. Optional: add a teaspoon of yogurt, kefir or fermented veggies when the broth cools down. That will increase the histamine load but will help boost the numbers of good bacteria in your belly!